You know you give one about the JP Trophy. Yeah, you love it. 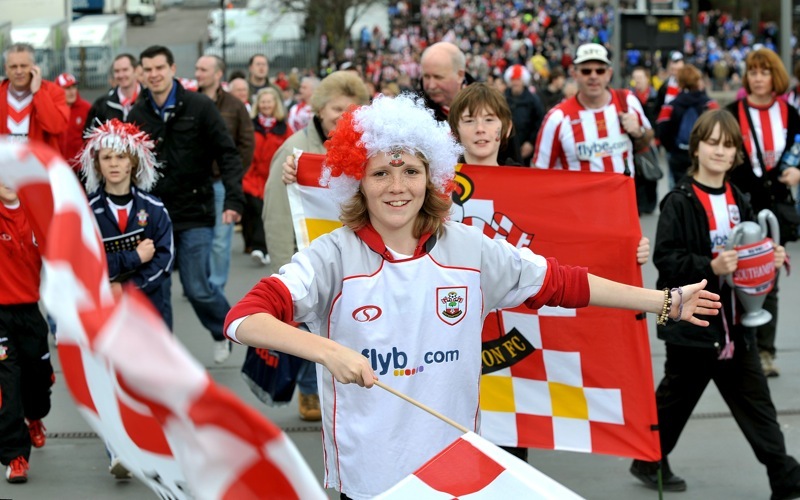 Southampton and Carlisle fans certainly did, but it was Saints who emerged victorious after a very one-sided final at Wembley, to win their first domestic trophy since winning the 1976 FA Cup. The south-coast club took the lead on 15 minutes through Rickie Lambert’s penalty after Peter Murphy handled in the area. Adam Lallana doubled the lead just before half-time when he headed in from Michail Antonio’s long throw. Saints’ decisive third goal came just after the break from a Papa Waigo header, then Antonio scored the fourth with a smart low shot from the edge of the box. On 84 minutes, sub Gary Madine headed home Ian Harte’s free-kick late on to give Carlisle a consolation goal. Perhaps the most impressive thing about the final was the turn-out, with some 44,000 Southampton fans making the trip to Wembley and almost 30,000 Carlisle fans. Good show. Do me a favour!! Were you actually at the game???? Did you have a look around you?!?!?! Carlisle sold 21,000 (of which 500 were saints fans buying their tickets when ours sold out) Saints offical allocation was 44,000 PLUS a further 8,000 or so made up mainly of Saints in Hospitality and Club Wembley. There certainly wasn’t any neutrals there!! Wembley was well and truly Red & White for the day… even the most ardent of Carlisle fans would agree. Well happy result. hate Carlisle scum, they cheated their way past leeds. using laser pens even in pen shoot out, ref was bought or biased, good lord.